The 26650 Stingray X mechanical mod is unique in the sense that it is not truly a clone, as an authentic 26650 Stingray X does not exist. In spite of not being a clone, the 26650 Stingray X mod is aesthetically based on the authentic Stingray X by JD Tech, which is an 18000 series mechanical mod. 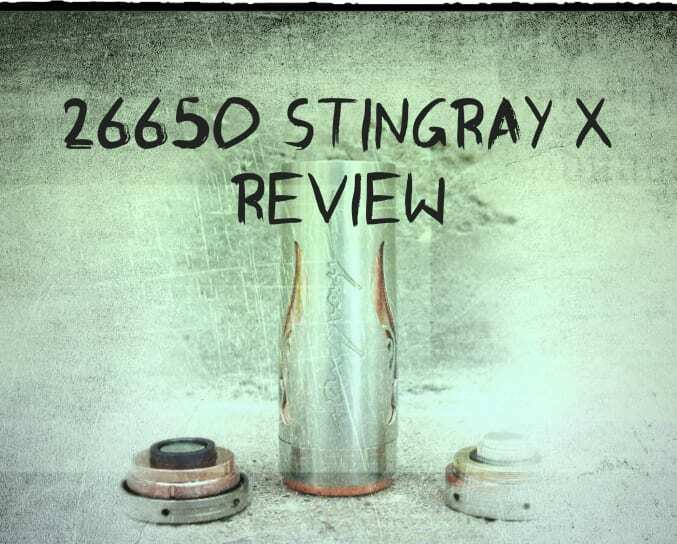 You can read our 18650 Stingray X Review here. The 26650 Stingray X mod featured in this review comes from the US Warehouse of Angelcigs.com, and it retails for $37.99 USD. 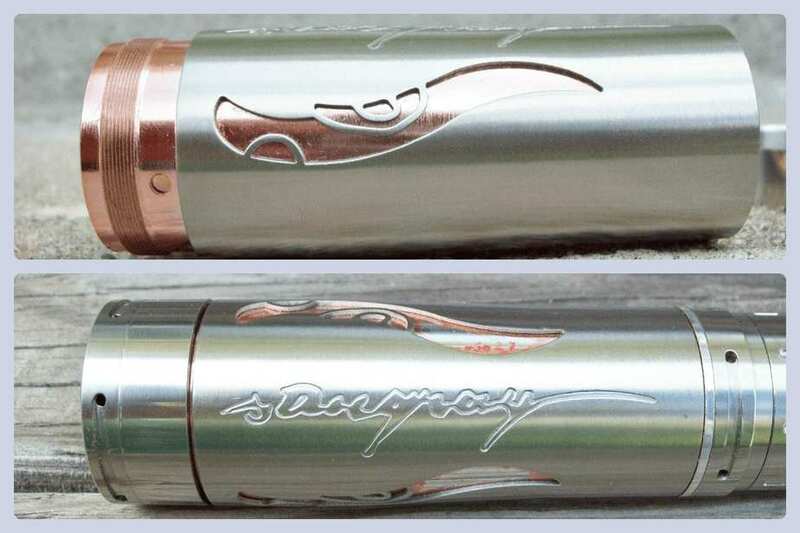 At present there are two versions of the 26650 Stingray X mechanical mod available on the market. This 26650 Stingray X variant is made by Shenzhen United Electronic Technology Co, LTD, also known as the Chinese trading brand iVOGO. 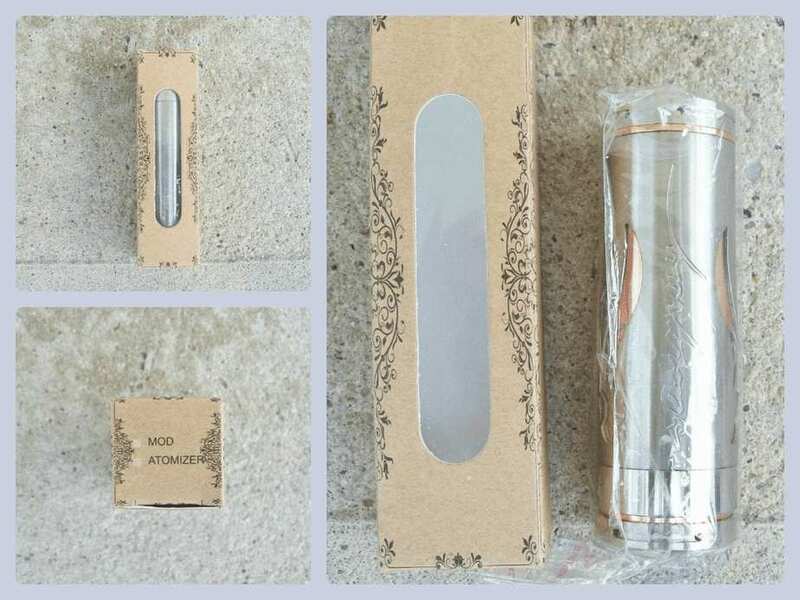 The mod comes packaged in a simple brown paper windowed box without the iVOGO brand logo printed on the package, as this mod is trading with the option for OEM branding. 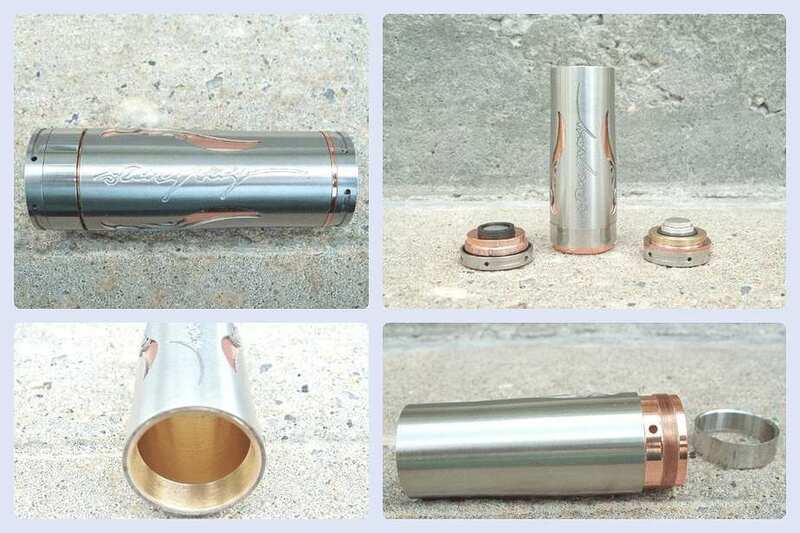 What is immediately apparent upon removing the 26650 Stingray X mod from its package, is that this mod is not made with real copper, but rather it is a brushed stainless steel outer tube, with a copper plated brass inner tube and accents. This is disappointing considering that neither the manufacturer nor vendor specs give any indication that the copper tube and accents are all copper plated, over silver plated brass. The engraved Stingray logo, and decorative cut outs are not a 1:1 replication of the authentic Stingray X logo, and is a bit sloppy in its execution. The mod is comprised of the main body 26650 tube, top cap, switch and stainless steel locking ring. The main body tube has very fine threading that appears to be .5mm in pitch, and is gold plated. In spite of the gold plated threads, both the top cap and switch thread smoothly on and off the main body tube. The stainless steel locking ring is surprisingly thick and threads nicely on and off the copper plated end of the tube, which also has two large vent holes drilled through it. In spite of all the copper, gold, and silver plating on this mod it is otherwise well made. It has a solid and sturdy feel in the hand and it doesn’t feel as though the inner and outer tubes would possibly separate, or fall apart after long term use. The top cap is substantial feeling in terms of weight and nicely constructed from stainless steel wrapped brass. It has some copper plated accents around the outer tube and the inner recessed surface of the top cap. The dual adjusting contacts are silver plated brass set within a black delrin insulator. There are 6 holes drilled in around the circumference of the top cap however, this is purely decorative. 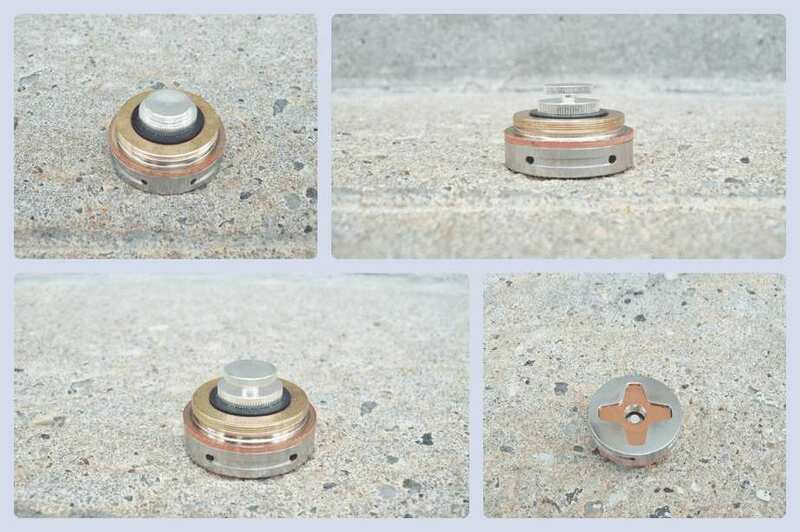 The holes do not lead into any air paths in the top cap, and therefore this mod is not suitable for use with devices that receive its air from the 510 connection. The finely threaded top cap makes for a lot of screwing in and out of the main tube, which can be annoying when you are making adjustments for battery fitment. Based on solely appearances, the switch is not nearly as nice or apparently as well constructed as the top cap. However, in this case looks are a bit deceiving, I will elaborate further on this in the performance section of the review. The switch has a simple spring loaded assembly with a rice pin to keep the switch from spinning, and thereby causing the negative contact to unscrew from the base. The 6 vent holes drilled around the circumference of the outer bottom switch, and slotted threads on the inner base of the switch housing which also has a 2mm spatial difference between the inner threaded base and bottom switch, all make for adequate battery venting in this mod. I was surprised, and disappointed by the switch logo which looks and feels more like some kind of powder coating rather than a laser etch. However, I must say that the switch logo has really held up well, it has neither faded nor chipped/scrapped off after more than 3 weeks of solid use. Unfortunately, even as the switch logo has held up, the copper plating on mod of this mod has not. Within a few days of receiving and using the mod all of the copper plating around the top cap had rubbed off. In the before and after photo illustration below you can see that after 1 week of use that more than half of the copper plating beneath the logo cut outs had also rubbed off. I have fingernail polish with more staying power than the thin, cheap copper plating used on this mod. 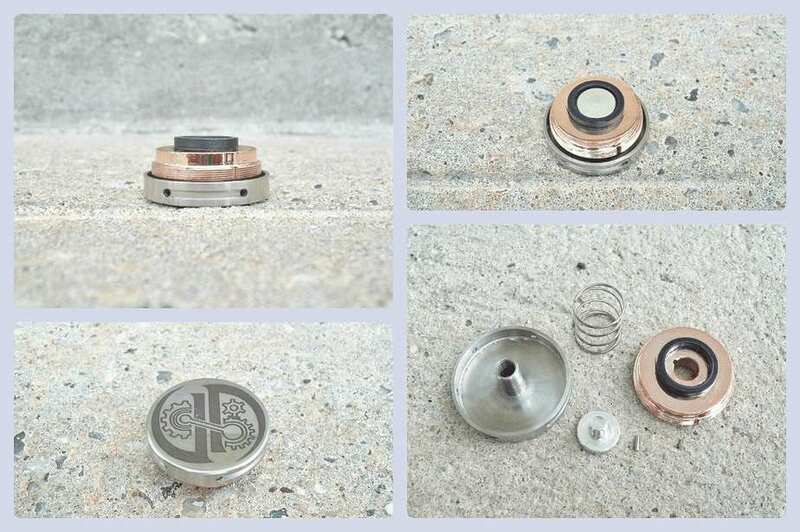 The only areas of the mod where the copper plating held up are on the inner recess of the top cap, the inner threaded base of the switch, and the lower portion of the main body tube where the locking ring threads on. I plan to use an acetone based nail polish remover to try to speed up the slow death that the copper plating is dying, as I am certain that it is a pink colored paint, and not a proper plate job. At last, there is some good news to report because this mod actually performs very well. As I mentioned earlier, when I unscrewed the switch housing and examined the switch, I was less than impressed. However, this switch has a light, smooth, near effortless switch action. For such a large, and almost rudimentary construction, I was surprised that the switch performs better than some 18650 bottom firing mechs that I have a total shocker. While the switch spring is strong enough to keep this mod from firing under its own weight with a Aerotank Giant attached, it is not strong enough to keep this mod from looking like a the leaning tower of Stingray while standing unlocked. The 26650 Stingray X made by Shenzhen United Electronic Co. is also a hard hitting mech. This mod’s tested voltage drop under load with 1.5 ohm coil was .10, and .15 under load with a .9ohm build. For everything that this 26650 mod may lack in appearance, it certainly makes up for in performance. Some poor material/design choices aside, the 26650 Stingray X mod made by Shenzhen United Electronic Technology Co, LTD is a solidly built, good performance mechanical mod. I don’t understand why Shenzhen United opted for twice plated brass instead of genuine copper for this mod, as I cannot imagine that the former was a more cost effective choice. 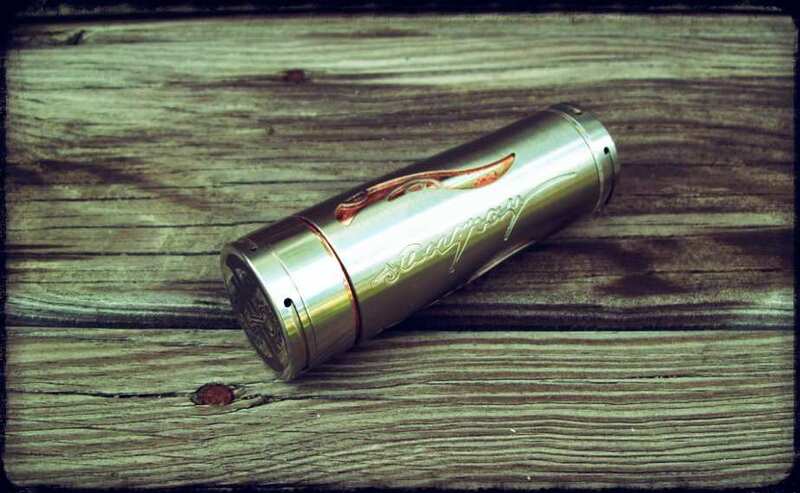 There is another 26650 Stingray X mod that is presently available on the market, which is made with real copper, a magnetic switch design, is aesthetically closer to the original Stingray X design, and is retailing at a lower price point. The other 26650 Stingray X variant is actually in transit to me now, so keep an eye out for that review. Had Shenzhen United Electronic Technology Co, LTD opted to construct this mod with genuine copper, or at the very least with better quality copper plating that didn’t come off easier than nail polish, this mechanical mod would have been an easy two thumbs up for me. Instead I must give it one thumb and some serious side eye. The black stingray X clone from angelcigs looks like a copper body, but I wander if it is the same? I hope not because I plan on getting that one. Cannot wait for the other review of the 26650 stingray!